In a first-of-its kind article for this author, this piece answers reader questions that may be pertinent to a broader subset of my audience. Questions cover a wider range of areas of interest - equity factor tilt strategies, pair trades, synthetic high yield credit risk, and the implication of taxes on dividend strategies. Hopefully, this article can be a useful forum for the Seeking Alpha community. One of the enduring features that makes Seeking Alpha unique and successful is the community it fosters between readers and contributors as we collectively "seek alpha" together. Investment ideas get immediate feedback, and thoughtful comments and dialogue can shape the arguments for and against a given thesis. I have contributed to Seeking Alpha on-and-off for seven years, and now have more than 12,000 followers through millions of page views. Some readers reach out to me directly through the message function with observations and questions. While I would like to answer each individually, my authorship here is a side hobby from my day-to-day career as an institutional investment manager. Without the capacity to address questions individually, I thought I could begin a forum that answers interesting questions in article form so that more readers with similar queries can be addresses. So here goes the inaugural Ploutos Mailbag. If readers like this approach, perhaps this could become a recurring feature. Luxx1 asks: "Thanks for the great articles! Quick question, where did you get your data on the historical performance of the different factors or did you build them yourself? I've looked around at data providers like MSCI, but don't know if there are other avenues I should be exploring." Many of the articles I write on Seeking Alpha examine the underlying indices of various exchange-traded funds. With many of these funds having post-crisis inception dates, readers only looking at the vehicle's trading history do not get to see how the strategy would have done over a full business cycle or many business cycles. Stress testing these strategies in a recessionary environment is an important feature of examining the prospects for generating satisfactory risk-adjusted returns. With 98% of the ETF universe in passive rather than active strategies, there is almost always an index that the fund is supposed to track. Most of the indices have much longer histories than the life of the fund. While some of these histories may be simulated, if the index inclusion and rebalancing rules are straightforward, this information is easily constructed. Many of the index providers will provide methodologies, factsheets, or even white papers on the strategy. If the data is not readily accessible from the index provider, I tend to use my Bloomberg terminal to analyze the data. Unfortunately, these terminals can be prohibitively expensive for retail investors. For very long (and freely available) datasets, I tend to use the public website curated by Dartmouth professor Kenneth French, which has an absolute wealth of information. Long-time reader RKupp asks: "Is there any chance you could compare the results of ijh and xmlv using back testing and or tell me how to do it. You have written great articles on both and I am interested on how their results compare side by side." Speaking of long-term datasets, RKupp asked for an analysis of ETFs replicating the S&P MidCap Index (IJH) and the S&P 400 MidCap Low Volatility Index (XMLV), a subset of the broader constituted by stocks with the lowest trailing volatility, periodically rebalanced. Below I have graphed the fill available dataset for the underlying indices for the mid-cap index and the low volatility mid-cap strategy against the S&P 500 (SPY). You can see why RKupp is interested in mid-cap stocks. The broad mid-cap index has bested the large cap S&P 500 by about 219bp per year. The low volatility-tilted mid-cap strategy has done even better, besting the S&P 400 Mid-Cap Index by 12bp per year with lower volatility. The outperformance of the low volatility tilt versus the capitalization-weighted mid-cap strategy is not as impressive as with the small-cap or large-cap low volatility tilts, but this is still a strategy that has delivered higher absolute performance with lower variability and smaller drawdowns over a nearly three decade sample set. Mark Ferry writes: If your chart comparing the long-term equal-weight vs cap-weight is accurate then switching from SPY to RSP is a no-brainer. Could you please provide the source of that chart? Thanks. In another comparison, reader Mark Ferry is looking for a long-run performance of the capitalization-weighted S&P 500 and the equal-weighted S&P 500 (RSP). From Bloomberg, there is information dating back to 1989 on these specific indices, which shows the long-run outperformance of the equal-weighted strategy. Simply equal-weighting the S&P 500 constituents versus their traditional capitalization-weighting would have lead to 137bp of annual performance, a 50% cumulative outperformance over the past 30 years. In my boringly named "Very Long Excess Returns from Equal-Weighting, I examined 90 years of data from 1926-2016 and showed that equal-weighting the U.S. stock universe bested capitalization-weighting by an enormous 281bp per year. The source of outperformance for equal weighting is a combination of the size premium from the average equal-weighted holding have a smaller market cap, and from contrarian rebalancing which buys stocks that have cheapened to return to equal-weights. Logan Kane asks: "What do you think about using the 5-year HY CDS contracts on ICE as an alternative to buying junk bonds either directly or via ETFs? Seems like they're more flexible and have lower transaction cost as well as tax advantages for investors in the top tax bracket. Am I missing something?" Credit default swaps are not a topic I have authored about frequently on Seeking Alpha. Readers should think of credit default swaps as an insurance contract on the probability of default of an issuer. For example, if an investor has a bond investment in issuer XYZ, it may wish to hedge against the probability of default rather than simply selling the bond and reinvesting. Another investor may be willing to assume the credit risk of that issuer for a spread premium. In 2012, I looked at the credit default spreads of S&P 500 constituents to describe for Seeking Alpha readers the creditworthiness of the index constituents. Last year, I described for Seeking Alpha readers the probability of a credit default priced into contracts of Tesla (TSLA). In the pre-crisis era, much of the credit default swaps were done bi-laterally between financial institutions. As credit risk increased systematically, there was uncertainty about whether financial institutions that had provided default insurance would be able to honor their commitments. In the post-crisis era, clearinghouses like ICE and enhanced collateral requirements have reduced counterparty risk. This is still a market that is only efficient for institutional investors. As recent lawsuits have shown (see Windstream/Aurelius), credit default contracts can lead to ineffective risk transfer. This is a playground for institutional investors looking for efficient large scale re-positioning of risk and not for retail investors. Carebest14 asks: Given that US treasury bonds are considered some of the safest investments in the world, why not invest in a 2x or 3x (e.g. TMF) relationship as opposed to a standard type of relationship (e.g. TLT)? An author shows that if you had bought and held TMF you would have had almost the same return as the S&P 500 without the needed risk. Have you ever studied this as an option? Levering Treasuries is a way to take incremental interest rate duration. In periods of declining interest rates - like most of the past thirty years - that would have been a good strategy. In 2013, when interest rates rose during the taper tantrum, TMF produced a total return of -39%, a return worse than the return for the S&P 500 in 2008. The particular article referenced by this reader from another contributor had some methodological errors that understated this volatility. Generally, I like levering low volatility assets to earn higher risk-adjusted returns than un-levered higher risk assets. I have done this to successful effect strategically with low volatility equities and tactically with fixed income. You need to make sure that what you are levering provides long-term risk premia above your cost of leverage. With a flat and relatively low yield curve, I would not enter into this strategy. 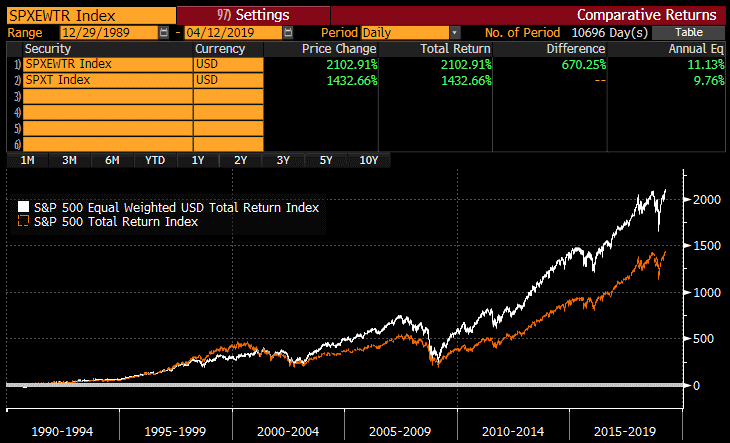 The well-named Dan in Mexico writes: I remember you writing some articles on two ETFs that had outperformed the market every year since 2000. I can't seem to find them. SA is only showing me your articles to about mid 2018. Can you give me the link to the article, please? I wrote two articles that combined factor tilts - one on Value (RPV) and Low Volatility (SPLV) and another on Dividend Aristocrats (NOBL) and Equal-Weighting (RSP). 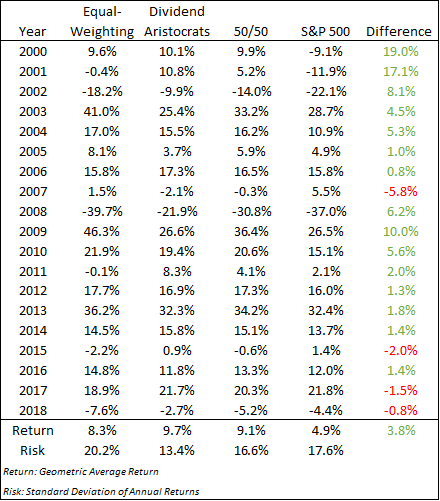 After 2019, the combinations of these strategies have delivered for 15 of 19 years, but still posted meaningful absolute and risk-adjusted performance versus the broad market index. Below is a table of the underlying index performance for the aforementioned indices. Several readers have asked about the merits of the S&P 600 Low Volatility High Dividend Fund. 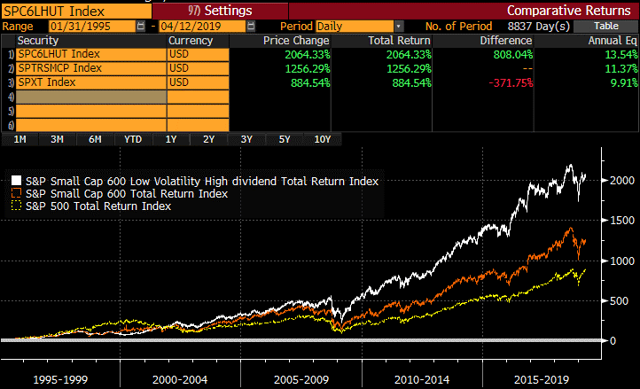 I have long extolled the virtues of the S&P 500 Low Volatility High Dividend Fund (SPHD), a monthly pay vehicle that selects the 50 lowest volatility stocks among the highest 75 dividend payers in the S&P 500. 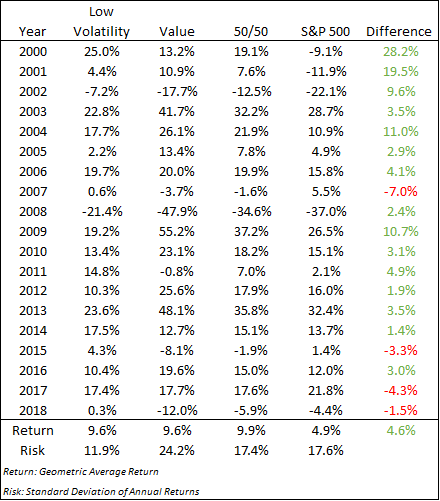 The strategy has delivered higher absolute and risk-adjusted returns over its index history. Since readers know that I also favor low volatility small-cap stocks, several have pointed towards the S&P 600 Low Volatility High Dividend Fund as an attractive alternative. 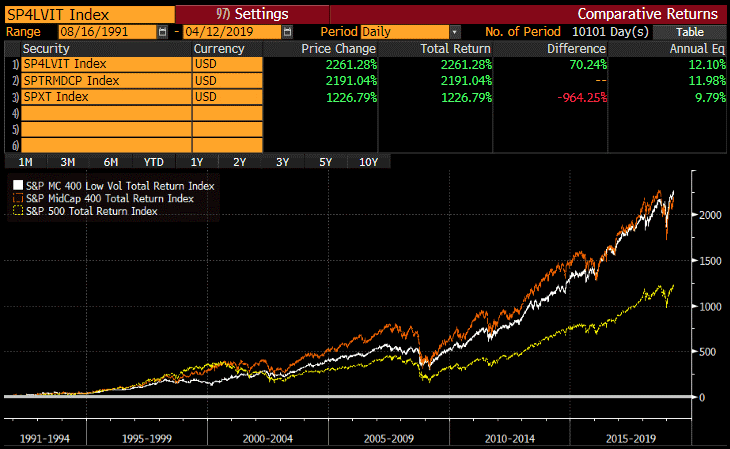 The long-run backtest indeed looks promising, strongly outperforming the broad small cap index, which has in turn outperformed the large cap benchmark. For the repeated interest in the fund, it has only amassed $21M of assets under management, making me concern about the fund's liquidity and longevity. I may need to write a piece on the underlying investments herein as a potential screen for readers who are intrigued by the strategy. Dash_Riprock states: Thanks for writing your article "...Dividend Growth Update". I am curious, would your arguments hold up if you considered payment of taxes? Some of us live in high-tax states and even with qualified dividends we pay Fed tax, state tax and Obama care tax on dividends. Growth stocks compound tax-free until you sell. With some of my readers investing in tax deferred accounts and operating in differing tax regimes, it typically makes the most sense to think about pre-tax returns. Taxes certainly matter. The goal for most investors should be to maximize real risk-adjusted returns after tax. I would be carefully in dismissing dividend-paying stocks. In research dating back 90 years, I have shown that stocks that paid zero dividend have produced inferior absolute returns with higher variability and drawdowns than dividend payers. While investors should not ignore the impact of taxes, investors should not avoid taxes at the expense of reducing total returns. Placing your most tax-inefficient assets - taxable bonds, REITs, actively managed funds with high levels of capital gains distributions, and higher dividend strategies - into tax-advantaged accounts and placing your tax-efficient investments - long-term-focused, low turnover equity strategies and tax-exempt municipal bond funds - into taxable accounts can improve tax-adjusted returns. Increasing financial literacy is a motivator of my authorship. I want to answer as many reader questions as possible, but that effort would crowd out my ability to author on subjects for a broader audience. I hope readers benefit from this article and the mailbag approach in general. If this article is well-received by readers, please send additional questions and we can revisit this format in a few weeks. My articles may contain statements and projections that are forward-looking in nature, and therefore inherently subject to numerous risks, uncertainties and assumptions. While my articles focus on generating long-term risk-adjusted returns, investment decisions necessarily involve the risk of loss of principal. Individual investor circumstances vary significantly, and information gleaned from my articles should be applied to your own unique investment situation, objectives, risk tolerance, and investment horizon. Disclosure: I am/we are long SPY,SPHD,XSLV,NOBL,RSP,RPV,SPLV. I wrote this article myself, and it expresses my own opinions. I am not receiving compensation for it (other than from Seeking Alpha). I have no business relationship with any company whose stock is mentioned in this article.